Skjellyfetti wrote: Pretty cool. His preaching style will be a shock for the royals. But, I guess he will tone it down some. Shared a beer with him back when he was Bishop of NC. Yes, but is he MAGA-ing? Meant to post it in the "news stories that don't warrant their own thread" thread. But, since you mention it - it is MAGA-ing. Just not in the Trumpian sense. Pwns wrote: Somebody forgot to tell the Norks we aren't to be trusted because we reneged on the Iran deal. They can't really trust us less than they already do...which is exactly 0%. I don't know why (I should know better) but I'm amazed by the complete roll reversal since the 2016 elections. It's like the Donks and the Conks exchanged playbooks. Do we want to be trusted by a country like North Korea? Weren't we just talking about reductio ad absurdum? But I'll play - there's nothing wrong with it depending on whose trust we're after. Would we pride ourselves on being viewed as trustworthy by Russia? What about Japan or Germany in 1939? So I'll ask again - to be trusted by North Korea, Russia or Iran - what would that look like? What would we need to do to earn the trust of fundamentally dishonest regimes? Maybe we could sell Iran some weapons under the table - that would foster some trust, wouldn't it? Reagan was a trust building genius? Welcome to the Reagan fanclub Kalm! Did I say something about sacrificing principles or leverage in order to gain trust? Why wouldn't we want to be trusted by a country like North Korea? Trustworthiness is a virtue that only applies to individuals? The US can be trusted to honor deals it makes. The US can be trusted to follow through with threats. The US can be trusted to not negotiate with terrorists. The US can be trusted to never enter agreements with bad actors. Sounds horrible and weak, Niccolo. Exactly. It was a good thing when Saint Reagy did it. Earning the trust of a country that sees enemies everywhere is at best unreasonable and at worst impossible. 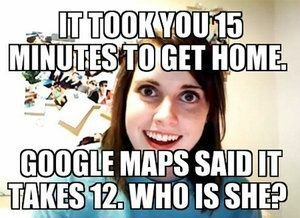 It would be like trying to earn the trust of "overly attached girlfriend". The best thing you can do is to just show them they've got no other choice than to go along. Pwns wrote: Earning the trust of a country that sees enemies everywhere is at best unreasonable and at worst impossible. Doesn’t every country see enemies everywhere? Figuratively speaking maybe. But with North Korea it's close to being literal. It's easily the most insular country on Earth. Maybe they just need a hug? UNI88 wrote: Reagan was a trust building genius? Welcome to the Reagan fanclub Kalm! Iran Contra is a stain on Reagan's legacy. With that in mind, how should we view Obama's Iran deal? UNI88 wrote: Iran Contra is a stain on Reagan's legacy. With that in mind, how should we view Obama's Iran deal? Yeah not exactly the same. So...we impose trade sanctions on China (ZTE) and now that they're failing, Trump is going to bail them out? Help them survive? WTF? Are we Making China Great Again? Ibanez wrote: So...we impose trade sanctions on China (ZTE) and now that they're failing, Trump is going to bail them out? Help them survive? Not without something in return.............maybe? But the optics aren't that good (at least to this independent person). All throughout the campaign it was "America Good, China Bad","America First", etc... ZTE gets accused of espionage, we sanction it and now we're going to save it? Trump need to get off Twitter and present a clear message. Why this Chinese company? Because they procure American parts? Some more information is needed but something is rotten in the State of Shenzhen. I'm sure the Chinese government pledging $500 million to a project in Indonesia with Trump branded hotel, golf course, and residences did not influence his decision in any way whatsoever. The wolves are baying about the Emoluments Clause. She looks like Wallis Currie-Wood. or maybe a birthday cake and a Bible? I think that worked with Iran. Pocket change. Dude makes $3 million every time he golfs. The classified emails she passed through her personal, unsecured server? Yeah - there isn't anything shady about that. Hell, who here HASN'T hired a company to do that instead of using the email infrastructure that their employer already provides. It's common place. I know I had a server in my bathroom managing all my emails and communications when I held a TS clearance with SAIC, Booz Allen and DHS. Again - it wasn't the emails per se, it was the disregard for protocol and rules (rules that were in place) and the mishandling of information.